Sodalis glossinidius, a vertically transmitted microbial symbiont of the tsetse fly, is currently considered as a potential delivery system for anti-trypanosomal components that reduce or eliminate the capability of the tsetse fly host to transmit parasitic trypanosomes, an approach also known as paratransgenesis. An essential step in developing paratransgenic tsetse is the stable colonization of adult flies and their progeny with recombinant Sodalis bacteria, expressing trypanocidal effector molecules in tissues where the parasite resides. In this study, Sodalis was tested for its ability to deliver functional anti-trypanosome nanobodies (Nbs) in Glossina morsitans morsitans. We characterized the in vitro and in vivo stability of recombinant Sodalis (recSodalis) expressing a potent trypanolytic nanobody, i.e. Nb_An46. We show that recSodalis is competitive with WT Sodalis in in vivo conditions and that tsetse flies transiently cleared of their endogenous WT Sodalis population can be successfully repopulated with recSodalis at high densities. In addition, vertical transmission to the offspring was observed. Finally, we demonstrated that recSodalis expressed significant levels (ng range) of functional Nb_An46 in different tsetse fly tissues, including the midgut where an important developmental stage of the trypanosome parasite occurs. We demonstrated the proof-of-concept that the Sodalis symbiont can be genetically engineered to express and release significant amounts of functional anti-trypanosome Nbs in different tissues of the tsetse fly. The application of this innovative concept of using pathogen-targeting nanobodies delivered by insect symbiotic bacteria could be extended to other vector-pathogen systems. The contemporary response to vector-borne infectious diseases still mainly relies on low-technology interventions, with a major emphasis on vector control through the use of insecticides. As vector-borne diseases continue to present significant threats to human, animal and plant health, there is an urgent need to develop control efforts that remain effective over time. Genetically modified disease vectors that are rendered resistant (refractory) to pathogen transmission can provide unique tools for developing new or complementing existing control strategies (reviewed by ). Paratransgenesis is one such approach that aims to reduce vector competence by genetically modifying symbionts of disease vectors and has been demonstrated for Rhodnius prolixus, the triatomine vector of Chagas disease  and Anopheles gambiae ,, the principal malaria vector in Africa. A paratransgenic approach in tsetse flies, the sole vector of major African trypanosome parasites (T. brucei sp. and T. congolense), is of high interest since tsetse flies are not amenable to germ-line transformation due to their viviparous reproductive biology (intrauterine development and parturition of live offspring ). The tsetse fly harbors a natural commensal bacterium i.e. Sodalis glossinidius, which is ideally suited as a paratransgenic platform organism since it i) resides in different tsetse tissues that are in close proximity to pathogenic trypanosomes (e.g. midgut) ; ii) can be cultured and genetically modified in vitro ,; iii) is maternally transmitted to the offspring  and iv) is restricted to the tsetse host niche ensuring that this symbiont is a safe candidate for use in the paratransgenic strategy . The characteristics of the selected effector molecule will largely determine the efficacy and specificity of this paratransgenesis approach. Low specificity will generally result in bystander effects that could have a direct or indirect fitness cost for the arthropod. The use of highly specific compounds from the adaptive immune system of vertebrates such as antibody derived fragments is likely to enable highly specific effects without conferring a selective disadvantage to the (para)transgenic arthropods . Nanobodies® (Nbs), representing the smallest known intact antigen-binding fragments derived from camelid heavy-chain only antibodies (HCAbs) , are therefore considered as excellent candidates to increase the immune competence of tsetse. Nanobodies targeting distinct epitopes of the variant-specific surface glycoprotein (VSG), abundantly present on the surface of bloodstream trypanosomes have already been identified, some of which were shown to exert direct in vitro and in vivo trypanolytic activity by interfering with the complex endocytotic machinery that is organized in the flagellar pocket of this parasite . Recently, we developed recombinant Sodalis (recSodalis) strains expressing functional anti-trypanosome nanobodies. These strains were shown to release considerable amounts of functional anti-trypanosome Nbs to the extracellular culture environment and to have no negative effects on the bacterium in an in vitro context . Another prerequisite in developing paratransgenic tsetse flies is the development of a methodology that allows the stable repopulation of tsetse flies with recSodalis strains expressing trypanosome-interfering proteins in insect tissues where trypanosome parasites reside. Previously, recSodalis expressing green fluorescent protein (GFP) has been successfully introduced into tsetse through thoracic microinjection . Here, GFP-expressing Sodalis was found to be present in the haemolymph and gut tissues of injected females and their progeny. However, to date no studies have focused on the densities whereby genetically modified Sodalis, expressing heterologous genes, are maintained within the fly and the efficiency of their transmission to the offspring. In this study, a recSodalis strain was tested for its ability to deliver functional anti-trypanosome Nbs in the tsetse fly Glossina morsitans morsitans. The in vivo long-term stability of the recombinant strain and transmission to the progeny was measured using a quantitative PCR (qPCR) analysis. We show that recSodalis expressing a potent trypanolytic nanobody, i.e. Nb_An46, was stably maintained in vivo only when the WT Sodalis population was significantly reduced (>95% of the normal population) prior to recSodalis introduction. Furthermore, we demonstrated that significant levels of functional Nb_An46 accumulated in different fly tissues, including the midgut where an important developmental stage of the trypanosome parasite occurs. Prior to the introduction of recSodalis into experimental flies, the Nb expression profile, in vitro growth rate and plasmid stability of recSodalis expressing a FliCpelBNb_An46 fusion protein (Sod:FliCpelBNb46fliC) was established. Extracellular Nb_An46 expression was confirmed by Western blot analysis of supernatant from cultures grown to the beginning of stationary phase (OD600 0.5-0.6) (Figure 1). Nb_An46 expression and release was quantified at different time points during bacterial growth over a 10-day period by measuring the concentration of active Nb in the whole cell lysate and culture medium using a VSG-binding ELISA assay. Functional Nb_An46 was expressed from day 2 onwards and accumulated in the culture medium to a concentration of 88 ng/ml by day 10 (Figure 2B). RecSodalis showed normal growth kinetics (Figure 2A) with cell population doubling times comparable to a WT Sodalis strain i.e., 15.0 hrs and 14.8 hrs respectively. The number of plasmid copies per cell was estimated to be approximately 20 during the lag and exponential phases of Sod:FliCpelBNb46fliC grown in the presence of antibiotic selection. The stability of the FliCpelBNb46fliC plasmid in recSodalis was measured by maintaining the recombinant bacteria in log phase growth for 27 generations in liquid MM medium in the absence of antibiotic selection. Colony counts on antibiotic-selective plates showed that 94% of the Sodalis population remained antibiotic resistant after 27 generations (corresponding to a 2-month test period) (Table 1). Qualitative analysis of extracellular Nb_An46 expressed by Sod _pFliCpelBNb46 fliC in vitro . 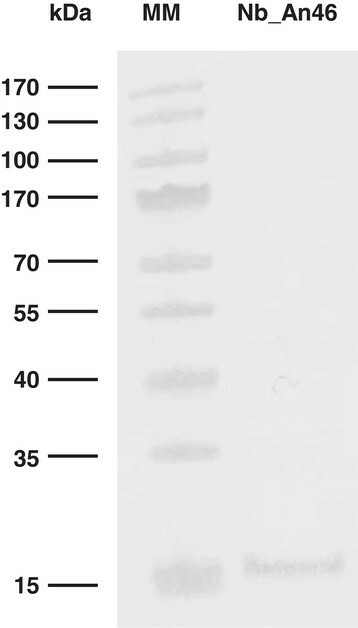 The extracellular expression of Nb_An46 was analyzed by immunoblotting of the medium supernatant using an anti-His antibody (1:1000 Serotec) for detection. Presented data are representative for at least three independent experiments. The PageRuler 10–170 kDa prestained protein ladder (Fermentas) was used as a molecular size marker (MM). In vitro characteristics of rec Sodalis expressing Nb_An46. A) Growth curve analysis of WT Sodalis and Sod_pFliCpelBNb46fliC. The error bars show the ± SD of two biological replicates. Samples were taken every 24 h. B) ELISA-based Nb_An46 quantitation (bar-chart) of the intra- and extracellular nanobody concentration produced by Sod_pFliCpelBNb46fliC at selected time points in relation to bacterial cell density (OD600nm, solid line) using a 6 × His tag specific detection antibody. Values are presented as ng recombinant protein per ml culture medium. Plasmid stability was expressed as the ratio between the number of colonies formed on MM blood agar plates with (50 μg/ml) and without kanamycin. We explored the capability of recSodalis to colonize the tsetse fly after introduction through intrathoracic injection. We first evaluated the necessity of the prior reduction of the WT Sodalis population in tsetse for recSodalis to establish and colonize its host. In female flies that received 3 streptozotocin supplemented blood meals, the WT Sodalis population was reduced by 95% and 88% in abdomen and thorax tissues respectively, compared to flies fed on normal blood. This treatment did not affect the obligatory Wigglesworthia symbiont population that mainly resides in the tsetse fly abdomen (Additional file 1: Figure S1). Next, the in vivo persistence and growth of the recombinant bacteria in streptozotocin-treated and non-treated flies injected intrathoracically with 5×104 CFU Sod_FliCpelBNb46fliC was evaluated using qPCR (Figure 3). In streptozotocin-treated flies, recSodalis was able to proliferate inside its host, reaching densities of 10- and 20-fold the initial injected dose in respectively abdomen and thorax, whereas in non-treated flies the injected recSodalis population was not able to expand and remained present at its initial density. Number of rec Sodalis CFU (DNA equivalent) in abdomen and thorax of streptozotocin-treated and non-treated male flies injected with 5x10 4 CFU of Sod _pFliCpelBNb46 fliC . Prior to injection, treated flies were given three blood meals supplemented with 20 μg/ml streptozotocin during the first week after emergence, while non-treated flies received normal blood meals. qPCR on the pFliCpelBNb46FliC plasmid was used as a means to estimate the number of recSodalis. The bars represent the mean recSodalis CFU (DNA equivalent) ± SD present in abdomen and thorax tissues of at least 5 individual flies from each treatment group at the time of sampling. The number of CFU (DNA equivalent) is represented in log scale on the y-axis. P values were calculated using the Mann–Whitney U test (*p <0.05, **p <0.01). We determined the optimal dose for recSodalis injection in terms of host colonization and its viability. For this, streptozotocin-treated male flies were microinjected with either 5 × 104, 5 × 105, 107 and 5 × 107 CFU Sod_FliCpelBNb46fliC and recSodalis densities in abdomen and thorax tissues were determined 7 and 14 days post-injection (dpi) using qPCR (Figure 4). Injection of 5 × 107 CFU resulted in an increased fly mortality (up to 59% mortality 14 dpi), whereas limited mortality (≤25% 14 dpi) was observed within the other injection groups. In these groups, recSodalis was able to repopulate the abdomen and thorax to densities comparable to natural Sodalis levels present in WT flies (on average respectively 2.5 × 106 and 1.5 × 106 CFU), demonstrating that a wide range of recSodalis doses (i.e. 5 × 104 to 1 × 107) are suitable to initiate colonization without affecting fly viability. Number of rec Sodalis CFU (DNA equivalent) present in abdomen (A) and thorax (T) tissues of flies injected with respectively 5×10 4 , 5×10 5 , 1×10 7 and 5×10 7 CFU of Sod _pFliCpelBNb46 fliC . qPCR on the pFliCpelBNb46 FliC plasmid was used as a means to estimate the number of rec Sodalis . The bars represent the mean recSodalis CFU (DNA equivalent) ± SD present in abdomen and thorax tissues of at least 5 individual flies from each treatment group at the time of sampling. The number of CFU (DNA equivalent) is represented in log scale on the y-axis. P values were calculated using the Kruskal–Wallis test followed by Dunn's test for multiple comparison (*p <0.05, **p <0.01). The in vivo persistence of Sod_FliCpelBNb46fliC was evaluated by qPCR based estimation of the amount of recSodalis CFU in abdomen and thorax tissues of streptozotocin-treated male flies injected with 1 × 107 recombinant CFU over a 28 day period (Figure 5A). Sod_FliCpelBNb46fliC was able to remain present at high densities in abdomen and thorax tissues of experimental flies throughout the course of the 28-day observation period. In flies injected with Sod_FliCpelBNb46fliC, the entire Sodalis population in abdomen and thorax remained recombinant. Next, we evaluated recSodalis densities in the haemolymph and midgut tissues of flies injected with 1 × 107 recombinant CFU (Figure 5B). Sod_FliCpelBNb46fliC was able to reach the fly midgut where it persisted at densities between 5 × 104 and 1 × 105 CFU (DNA equivalent) throughout the 21-day observation period. In these flies the obligatory Wigglesworthia symbiont population was not affected by the presence of Sod_FliCpelBNb46fliC (Additional file 1: Figure S2) nor did we observe any effect upon the fecundity of female recSodalis colonized flies. Transmission dynamics of the recombinant bacteria to the F1 progeny was evaluated by qPCR. Sod_FliCpelBNb46fliC was transmitted to the F1 generation, although non-plasmid containing Sodalis were dominant in these flies. Indeed, Sod_FliCpelBNb46fliC constituted only 7 and 5% of the entire Sodalis population in respectively abdomen and thorax (Figure 6). Evaluating the host colonization properties of rec Sodalis . 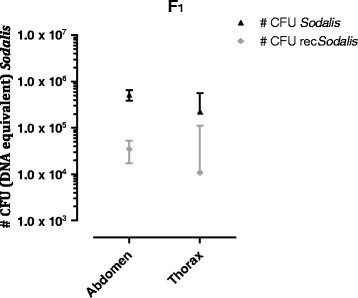 A) Number of recSodalis CFU (DNA equivalent) present in abdomen (solid red line) and thorax (solid black line) of Streptozotocin-treated flies injected with 1x107 CFU of Sod_pFliCpelBNb46fliC versus the total number of Sodalis CFU DNA equivalent (WT + recombinant Sodalis) present in abdomen (dashed red line) and thorax tissues (dashed black line). B) The number of recombinant and total Sodalis CFU (DNA equivalent) present in haemolymph (solid/dashed blue line) and midgut (solid/dashed grey line) were estimated as described above. Data points represent the mean recSodalis and total Sodalis CFU (DNA equivalent) ± SD present in the respective tissues of at least 5 individual flies at the time of sampling. The number of CFU (DNA equivalent) is represented in log scale on the y-axis. Transmission of rec Sodalis to the F 1 generation was evaluated. Recombinant and total Sodalis numbers were estimated as described above in abdomen and thorax of the F1 progeny (freshly emerged) produced by streptozotocin-treated female flies injected with 5 × 104 CFU of Sod_pFliCpelBNb46fliC. Data points represent the mean recSodalis and total Sodalis CFU (DNA equivalent) ± SD present in the respective tissues of at least 5 individual flies at the time of sampling. The number of CFU (DNA equivalent) is represented in log scale on the y-axis. Nb_An46 expression in flies injected with 1 × 107 Sod_FliCpelBNb46fliC CFU was quantified using a VSG-binding ELISA. 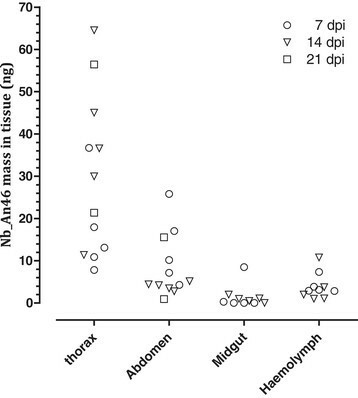 Nanobody concentrations were determined at different time points post-injection in whole abdomen and thorax extracts, haemolymph and midgut (Figure 7). Functional Nb_An46 accumulated in haemolymph and thorax samples of injected flies over time, indicating a continuous transgene expression by recSodalis in these tissues. 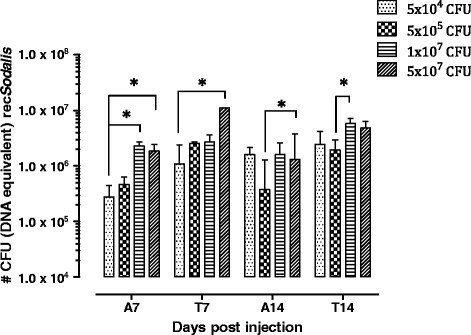 In the thorax the Nb_An46 concentration increased from 22 ng on day 14 post-injection to 35 ng on day 21. Although significant quantities of active Nb_An46 were detected in abdomen and midgut using a VSG-binding ELISA, the accuracy of this quantitation could have been hampered by the abundant presence of proteolytic enzymes in the tsetse fly gut, probably resulting in fast degradation of the nanobodies in the tissue homogenates and possibly resulting in the underestimation of the active Nb content of the non-digestive part of the tsetse fly gut. ELISA based quantitation of the amount of Nb_An46 present in haemolymph, abdomen, thorax and midgut of streptozotocin-treated flies injected with 1×10 7 CFU of Sod _pFliCpelBNb46 fliC at selected time points (○:7 dpi, ▽: 14 dpi, □: 7 dpi) using a 6 × His tag specific detection antibody. Values are presented as ng nanobody per whole tissue extract or 1 μl haemolymph. The aim of this study was to develop a functional Sodalis-based shuttle system that is able to deliver and express anti-trypanosome nanobodies within the tsetse fly. In this study a recombinant Sodalis strain was used expressing a potent trypanolytic nanobody Nb_An46 through a plasmid-based expression system. The functionality of the system was assessed by monitoring if recSodalis bacteria can (1) establish a stable population in the tsetse fly over time, (2) express significant levels of active anti-trypanosome nanobodies in the tsetse fly and (3) be efficiently transferred to the offspring. Although the growth characteristics of Nb-expressing recSodalis were shown to be similar with those of the WT Sodalis in in vitro culture conditions it is plausible that in the tsetse fly in vivo environment the endogenous WT bacteria could have a competitive advantage over the introduced recombinant bacteria. Our results clearly suggest that recSodalis is competitive with WT Sodalis in in vivo conditions, however the maximal total Sodalis density in the inner tsetse fly environment seems to be limited to approximately 5×106 CFU. Indeed, only when the existing WT Sodalis population is priorly reduced (>95%) by a selective antibiotic treatment, the introduced recSodalis population is able to maintain and proliferate to comparable density levels observed for wildtype Sodalis in normal tsetse flies. This recSodalis population is then able to outgrow the WT population which remains present at low density. In contrast, in non-treated flies recSodalis is not able to displace the WT Sodalis population but remains present at low density, confirming the importance of creating a WT Sodalis deprived niche that allows recSodalis to proliferate inside its host. An important factor when using episomally located plasmids in a paratransgenic system is the persistence of these recombinant strains in the tsetse fly in the absence of antibiotic selection as premature loss of expression due to plasmid instability would not be desirable. Therefore, we assessed the stability of the recombinant strains during in vitro culture maintenance and after re-introduction in the tsetse fly. Results from the bacterial plate assay showed that in the absence of selection pressure in the culture medium the FliCpelBNb46fliC plasmid proved to be stably maintained with 94% of the Sodalis population retaining the plasmid after 27 generations. This strong long-term plasmid retention in recSodalis was not always observed as for another strain (containing the FliCpelBNb33fliC plasmid) a complete plasmid loss in the total Sodalis population after 20 generations in culture. We postulate that the strong persistence of the FliCpelBNb46fliC plasmid in the recSodalis culture in the absence of a selection pressure is related to the high plasmid copy number that is observed in this strain and which was 20 fold higher than in the unstable Sod_FliCpelBNb33fliC strain. Sod_FliCpelBNb46fliC remained present at high densities in the fly throughout the 28 day observation period. Furthermore, recSodalis was able to disseminate into the digestive tract reaching densities comparable to those in flies harboring WT symbionts. Furthermore, the majority of the total Sodalis population remained recombinant for the duration of the experiment indicating that the high plasmid stability that was observed in the in vitro culture is also present in the in vivo tsetse fly environment. Although transmission to the F1 generation was observed, this seemed to be highly inefficient as only a small percentage of the total Sodalis population was found to be recombinant. This could be due to plasmid loss by recSodalis during the 30-day pupal stage or the inability of recSodalis to efficiently colonize the milk glands upon injection in the adult female fly which is a prerequisite for recSodalis transmission to the intra-uterine larvae through the milk secretion. Indeed analysis of transcripts encoding Sodalis motility genes, fliC and motA, and cell invasion genes, invA1 and invA2, are up regulated in the larval and early pupal stages, and not in adult tsetse flies . These results indicate that the Type-III secretion system and flagellum may be important for the transmission and establishment of symbiont infections in the intra-uterine progeny. Our results clearly indicate that for a successful use of Sodalis as paratransgenic vehicle in the tsetse fly several methodologies should still be improved allowing i) the generation of more stable recSodalis i.e. through an efficient methodology to insert exogenous DNA directly into the bacterial genome and ii) a more efficient transfer of the recSodalis to the next generations. RecSodalis was found to continuously express functional nanobody in the tsetse fly as indicated by the Nb_An46 accumulation in the haemolymph over time. Abdomen and midgut extracts from the majority of insects that carried the recombinant nanobody-producing bacteria were positive in the ELISA, indicating the presence of functional Nb in these tissues. However the abundant presence of proteolytic enzymes in the tsetse fly midgut probably interfered with detection, prohibiting accurate quantification of the Nb expression in this tissue. These results suggest the benefit of lowering the susceptibility of potential effector proteins to proteolytic degradation especially when they have to be functional in a digestive tissue such as the tsetse fly midgut. Nbs have the advantage that they can be mutagenized and selected for increased proteolytic stability . From our experimental data, the expected levels of in vivo Nb expression are in the lower ng range. However, these levels of Nb expression should be sufficient to interfere with trypanosome development given that an infective blood meal of a tsetse fly in nature is estimated to contain around 103 parasites as the average parasitaemia in T. brucei infected cattle fluctuates from 1.5 × 105 parasites per ml during the acute phase of infection to 5 × 104 parasites per ml during the chronic phase  and in vitro studies have shown that nanomolar concentrations of trypanolytic Nbs are sufficient to saturate >95% of the surface VSG molecules and to provoke efficient trypanosome lysis ,. Indeed, since a VSG:Nb molar ratio of 1:20 is sufficient to cause efficient lysis, 5 ng of Nb_An46 should be adequate to efficiently lyse 103 parasites. These data are the first to show the potential of Sodalis as a delivery system for anti-trypanosome effector molecules in tsetse fly tissues relevant for trypanosome development. Given the ability of recombinant S. glossinidius to efficiently establish in different tsetse fly tissues at high densities and their capacity to release significant levels of functional anti-trypanosome Nbs in tissues were trypanosomes reside, the foundation has been laid for further exploration of the inhibitory effect on trypanosome development in the tsetse fly. Moreover, a paratransgenic approach using Sodalis to deliver Nbs that target the trypanosome-tsetse fly crosstalk could open a new avenue to unravel the molecular determinants of this specific parasite-vector association. G. morsitans morsitans (Westwood) from the colony at the Institute of Tropical Medicine Antwerp (ITM), originated from pupae collected in Kariba (Zimbabwe) and Handeni (Tanzania), were used in all experiments. Flies, maintained at 26°C and 65% relative humidity, were fed 3 days per week with defibrinated bovine blood using an artificial membrane system. Sodalis glossinidius strains used in this study were isolated from the haemolymph of surface-sterilized tsetse flies from the colony maintained at ITM. Cultures were maintained in vitro at 27°C in liquid Mitsuhashi-Maramorosch (MM) insect medium (PromoCell) supplemented with 10% (v/v) heat-inactivated fetal bovine serum (FBS). Where appropriate, selection antibiotics were added to the media at the following concentrations: 100 μg/ml of ampicillin or 50 μg/ml of kanamycin. Flies used in this study were maintained at 26°C and 65% relative humidity, and fed 3 days per week with defibrinated bovine blood using an artificial membrane system. In this study the pFliCpelBNb46fliC plasmid was used in which a 6 × His tagged Nb_An46 gene was fused to two secretion signals (FliC and pelB) and cloned into the multiple cloning site of the pCM66 expression vector. The pFliCpelBNb46fliC plasmid was derived from pFliCpelBNb33fliC  by replacement of pelBNb_An33 between the XbaI and EcoRI sites by pelBNb_An46 amplified as a XbaI-EcoRI fragment (465 bp) by PCR from the pHen6C plasmid containing the pelBNb_An46 gene using the following primer set: Nb46_FW, 5’-TCTAGAATGAAATACCTATTGCCTACGG-3’ and Nb46_Rev, 5’-GAATTCTTAGTGATGGTGATGGTGGTGGCGGCCGCGTGAGGAGAC-3’ (XbaI-EcoRI restriction sites are underlined). Sodalis transformation with the pFliCpelBNb46fliC plasmid was conducted using a heat-shock based method as described in . Following transformation, the cells were allowed to recover overnight at 27°C in liquid MM medium prior to plating. Logarithmically growing cultures were used to inoculate 25 ml of MM-medium to an optical density at 600 nm (OD600) of 0.05. Sodalis cultures harboring the FliCpelBNb46fliC plasmid were allowed to grow without shaking for the first 24 h, after which they were transferred to a shaking incubator. Samples were taken every 24 h for optical density measurements and Nb protein quantification in culture supernatants and whole cell extracts. The cell population doubling time was calculated from the growth rate during exponential growing phase using the following equation: doubling time (in hours) = h*ln(2)/ln(c2/c1) where c1 is the initial concentration and c2 is the concentration when cultures reached maximum densities. The plasmid copy number per cell was calculated by dividing the absolute copy number by the number of Sodalis CFU present in the culture. The absolute number of plasmid and Sodalis CFU present in the Sod_FlicpelBNb46fliC culture grown in the presence of antibiotic selection (kanamycin 50 μg/ml) was estimated by quantitative real-time PCR (qPCR) on DNA extracted from culture samples taken during the lag and exponential growth phases using the QIAGEN DNeasy extraction kit (QIAGEN). PCR reactions were carried out on a LightCycler™ (Roche Diagnostics, Mannheim, Germany). To estimate the number of Sodalis CFU present in the culture, a standard curve was generated using DNA extracts from a serial dilution series (1:10) ranging from 107 Sod_FlicpelBNb46fliC CFU/ml to 102 Sod_FlicpelBNb46fliC CFU/ml. For pFliCpelbNb46fliC plasmid number determination a dilution series (1:10) ranging from 10-1010 plasmid copies μl−1 was prepared to establish a linear standard curve for real-time PCR assays. For Sodalis, primers that target a 120-bp region of the single-copy S. glossinidius exochitinase gene were used: Qchi_Fw, 5’- TGGGGACAGTACGATGGCAGAGC −3 ; Qchi_Rev, 5’- TCATAGGCGGTCGGGGATAATTGCG -3’. For the plasmid number determination, a 433-bp common region present on both pFliCpelBNb33fliC and pFliCpelBNb46fliC plasmids was amplified using the following primer set: pCM66_Fw, 5’- CTTGGCCCTCACTGACAG-3’; pCM66_rev, 5’- GCAGCCCTGGTTAAAAAC-3’. qPCR was performed in a 20-μl reaction mixture volume containing 10 μl of 2 × iQ™ SYBR green supermix, 0.3 μM of each primer, template (DNA ) and RNase-free sterile water to a final volume of 20 μl. The in vitro stability of the pFliCpelBNb46fliC plasmid in Sodalis was measured by maintaining recombinant bacteria in log phase growth for 27 generations in MM without kanamycin selection. Samples were taken every two to four generations and plated on MM blood agar with and without kanamycin. The ratio of the number of colony forming units (CFU) grown on the selective blood agar plate to those grown on the non-selective blood agar was used to determine the percentage of plasmid-carrying cells. This ratio allows to monitor the plasmid stability during subsequent generations in the cultured recSodalis. Cells were pelleted from bacterial cultures by centrifugation (15 min, 10000 × g) and the supernatant was clarified from residual bacterial cells by a second centrifugation step. Proteins in the growth medium were precipitated with 10% trichloroacetic acid (TCA) for 1 h on ice. For SDS-PAGE, samples were heat denatured at 95°C in the presence of SDS-PAGE loading buffer containing β-mercaptoethanol and analyzed on a 12% (w/v) polyacrylamide gel (Biorad). Proteins were transferred onto a Hybond C nitrocellulose membrane (Whattman). After overnight blocking with 1% (w/v) bovine serum albumin, the membrane was incubated sequentially with a mouse anti-6 × His-tag IgG1 antibody (1:1000) (Serotec) and a rabbit anti-mouse-IgG antibody (1:1000) (Serotec) conjugated to horseradish peroxidase. In between these successive 2 h incubations, the membrane was washed with PBS-0.1% Tween 20. Thirty minutes after adding the substrate (TMB 1-Component Membrane Peroxidase Substrate, KPL) the reaction was stopped by washing the membrane with water. To evaluate the effect of reducing the WT Sodalis population in tsetse on recSodalis growth inside its host, newly emerged male G. morsitans morsitans flies were divided into two experimental groups. The treated group was given three blood meals supplemented with 20 μg/ml streptozotocin while the non-treated group received normal blood meals. Next, treated and non-treated flies were briefly anaesthetized by cold shock and microinjected intrathoracically with a suspension of 5 × 104 Sod_pFliCpelBNb46fliC CFU, using a 5 μl Hamilton 75RN microsyringe with gauge 33 removable electrotapered needles. After injection, males were kept in separate cages and received an antibiotics-free blood meal every 48 h throughout the course of the experiment. The optimal recSodalis injection dose was evaluated by injecting streptozotocin treated adult male flies with respectively 5 × 104, 5 × 105, 107 and 5 × 107 CFU Sod_pFliCpelBNb46fliC followed by determination of the number of recSodalis CFU in abdomen and thorax 7 and 14 days post-injection. To evaluate the in vivo persistence of Sod_pFliCpelBNb46fliC, streptozotocin treated adult male flies were injected intrathoracically with 107 Sod_pFliCpelBNb46fliC CFU. At different time points post-injection i.e. day 1 (teneral), 7, 14, 21 and 28, the number of WT and recSodalis CFU present in abdomen, thorax, haemolymph and midgut was measured using qPCR. To evaluate the transmission of recSodalis to the F1 progeny, streptozotocin-treated female flies were injected intrathoracically with 5 × 104 Sod:pFliCpelBNb46fliC CFU. Females were allowed to mate with WT males and their offspring (teneral stage) was evaluated for the presence of recSodalis. At various time points post-injection flies were sacrificed for genomic DNA extraction using the QIAGEN DNeasy extraction kit (QIAGEN). We used a quantitative PCR (qPCR) method for the estimation of the number of WT Sodalis and recSodalis cells in tsetse fly tissues (abdomen, thorax, midgut and haemolymph). For this, triplicate cultures of WT and recSodalis were serially diluted (10-fold) in PBS to yield a Sodalis density ranging from 107 CFU/ml to 102 CFU/ml. DNA was extracted from each Sodalis dilution followed by qPCR using primers that amplify a region of the pCM66 plasmid backbone present in recSodalis: (pCM66_Fw, 5’-CTTGGCCCTCACTGACAG-3’ and pCM66_Rev, 5’- GCAGCCCTGGTTAAAAAC-3’) and primers that target a 120-bp region of the single-copy Sodalis glossinidius exochitinase (Qchi) gene to determine the corresponding Ct values. Standard curves were generated by plotting these Ct values against the corresponding log of Sodalis CFU/ml. This qPCR approach in combination with the Sodalis CFU standard curves allowed us to estimate the CFU (DNA equivalent) values present in the tsetse fly tissues of the different experimental fly series. An internal control was included to evaluate the DNA extraction efficiency in all the tissue samples. For this, samples were spiked with 0.4 ng of plasmid DNA (pBAD24_GFP) prior to extraction. qPCR with gfp-specific primers (pBAD24_GFP: GFP_Fw, 5’-TGGCCAACACTTGTCACTAC-3’ and GFP_Rev, 5’-AGAAGGACCATGTGGTC-3’) revealed a Ct value of approximately 24.5 in all the DNA extracts corresponding to the Ct value of the plasmid dilution used to spike to internal control alone demonstrating a uniform highly efficient extraction of the DNA in all the samples. Wigglesworthia quantification was done by amplifying the thiamine locus with the following primer set: QthiC_F, 5’-AAGTTATGATAGAAGGACCAGGAC-3’ and QthiC_R, 5’-CCCGGAGCAATATCAGTAGTTAG-3’. All Ct values were normalized to the G. morsitans morsitans reference gene β-actin for each sample using the following primer set: β-actin_F, 5’-GGCTTCTGGTCGTACTACT-3’ and β-actin_R, 5’-CCGGACATCACAATGTTGG-3’. For each sample the obtained Ct value of the thiamine gene was normalized to the Ct value of the reference gene (β-actin) by subtracting the β-actin Ct value from the thiamine Ct value to yield a ΔCt value for each sample. ΔCt values were log-transformed and compared using the Mann–Whitney U test to establish differences among treated and control groups. A value of p <0.05 was considered significant in all analyses. qPCR was performed in a 20-μl reaction mixture volume containing 10 μl of 2 × iQ™ SYBR green supermix, 0.3 μM of each primer, template (genomic DNA, standard) and RNase-free sterile water to a final volume of 20 μl. The amount of fluorescence generated was measured during each amplification cycle using the following program: (i) initial denaturing at 95°C for 3 min; (ii) 40 cycles, with 1 cycle consisting of denaturation at 95°C for 10 s, annealing at 60°C for 10 s, and extension at 72°C for 30 s. All assays were carried out on a LightCycler™ (Roche Diagnostics, Mannheim, Germany) in 96-well format plates in duplicate and were averaged for each sample. For each PCR run, a negative (no-template) control was used to test for false-positive results or contamination. In vitro . The amount of active Nb_An46 present in cytoplasmic extracts and growth medium was quantified using an optimized nanobody-detection ELISA . For this purpose, Maxisorb 96-well plates (Nunc) were coated overnight (4°C) with 200 ng purified soluble AnTat 1.1 VSG per well in 0.1 M NaHCO3, pH 8.2. Residual protein binding sites were blocked for two hours at room temperature with 0.5% bovine serum albumin (BSA) in PBS. Standards and samples were added for 1 h at room temperature. Detection of antigen-bound nanobodies was performed with a mouse anti-6 × His IgG antibody (Serotec) directly conjugated to horseradish peroxidase. Thirty minutes after adding peroxidase substrate, the reaction was stopped with 0.33 M H2SO4 and the optical density was measured at 450 nm (690 nm was used as reference filter). Protein concentrations were calculated from a standard curve fitted to a four parameter logistic equation using the Ascent software (Labsystems). Samples from the in vitro Sodalis culture were taken at the same time points indicated for the growth curve measurements. For each sample, 1 ml of culture media was centrifuged two times (8000 × g) to obtain the extracellular and whole cell fractions. The whole cell extracts were prepared by resuspending the cell pellets in 0.2 ml PBS supplemented with complete protease inhibitor (Roche) followed by sonication at an amplitude of 10 microns for 5 seconds (3 cycles on ice). For quantification of Nb_An46 present in cytoplasmic extracts and growth medium, a standard serial dilution series (1:2) starting from 2500 to 5 ng/ml of purified Nb_An46 was prepared in PBS and MM-medium respectively. MM medium and PBS alone were included as blanks. In vivo . Quantification of active Nb_An46 present in different tsetse fly tissues samples (abdomen, thorax, midgut and haemolymph) was performed at different time points post-injection. The preparation of the whole tissue extracts by sonication and the Nb-quantification by ELISA were performed as described above. To mimic the sample complexity of the abdomen, thorax, midgut and haemolymph extracts, nanobody standards were prepared in the corresponding tissue extracts from non-injected wildtype flies. The respective tissues from flies harboring WT Sodalis were included as blanks. This research was supported by an ITM SOFI grant, the InterUniversity Attraction Pole programme (IAP), FWO and the ERC-Starting Grant ‘NANOSYM’. This work is also performed in the frame of a FAO/IAEA Coordinated Research Project on “Improving SIT for tsetse flies through research on their symbionts and pathogens”. We wish to acknowledge the technical assistance of Jos Van Hees. Conceived and designed the experiments: LDV, GC, JVDA. Performed the experiments: LDV, GC, KDR. Wrote the paper: LDV, GC, JVDA. All authors read and approved the final manuscript.